A classic Hawaiian Ahi Poke with big chunks of tuna marinated with sesame oil, sweet onions, seaweed, candlenuts and Alaea salt. It makes for a delicious appetizer on its own or a delightful meal over a bowl of rice. 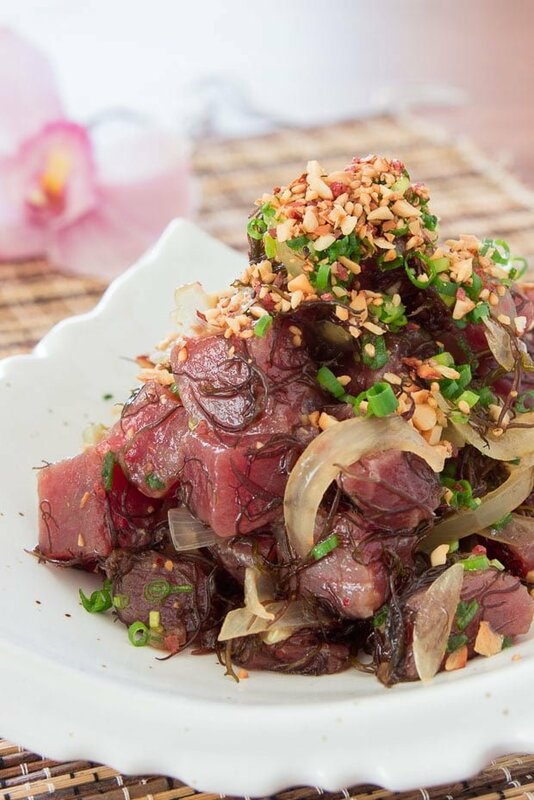 Tuna Poke (pronounced poh-keh) is one of my all-time favorite dishes. With velvety chunks of Yellowfin tuna glazed in fragrant sesame oil and chilies, crisp sweet onions, and toothsome seaweed, it’s a smile inducing medley of colors, textures and flavors. The thing that really sets this dish off though is a generous sprinkle of nutty inamona on top. Inamona is a condiment made with roasted candlenuts and Alaea salt. The candlenuts when roasted take on an earthy citrusy evergreen flavor along with a subtle bitterness, and the large crystals of Alaea salt provide a crunchy burst of salt with every bite. Candlenuts are often compared to macadamia nuts because of their similar shape and texture, but their flavor is quite different. That’s why I recommend using pine nuts as the closest substitute if you can’t find them where you live. 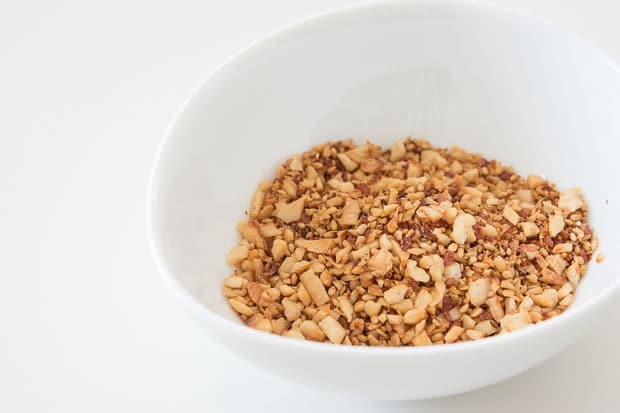 For my Tuna Poke, I like to add sesame seeds to my inamona, it’s not traditional, but I like the nutty flavor they add when toasted with the candlenuts. I also roast the nuts after I’ve chopped them because I like to make the inamona fresh every time I do Poke and it just doesn’t make sense to oven roast whole nuts when you’re only doing a few. Alaea salt is a Hawaiian sea salt made by mixing unrefined salt crystals with red volcanic clay. This gives the large grains of salt its characteristic rusty red hue. While you should be able to find it in upscale kitchen stores and online, it’s not going to ruin the dish if you substitute another salt. Fleur de Sel would be my recommendation but really any coarse sea salt will do. When choosing your tuna, look for pole-caught tuna, it’s not only the most environmentally friendly way of catching tuna, it’s also the safest as it tends to yield younger tuna which have a lower mercury content. Also, try and pick a piece without (or with as little as possible) white streaks in it. These streaks are the aquatic equivalent to the tough silverskin on meat and will leave you chewing your tuna far longer than you want to. To make the inamona, chop the candlenuts into small pebble sized pieces. 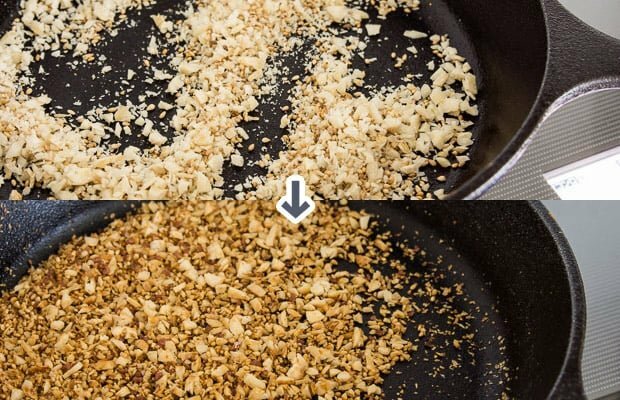 Put the chopped candlenuts and sesame seeds in a cast iron pan over medium high heat and toast them until they turn a medium brown color. You'll want to stir them constantly to make sure they brown evenly. When the nuts are brown, add the Alaea salt and stir to combine. Transfer the nuts onto a sheet of foil in a thin layer to let them cool. Slice the onions thinly and then soak them for at least 1 hour in a medium bowl of cold water with a teaspoon of baking soda. The baking soda neutralizes the volatile sulfur compounds that make raw onions so pungent, leaving you with crisp sweet onions without the tear inducing sting. When you're ready to use them, drain and rinse them well, and spin them in a salad spinner to remove the extra water. 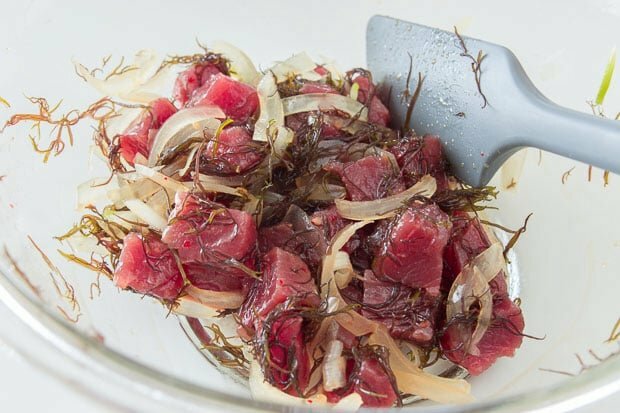 To make the Tuna Poke, whisk the sesame oil, soy sauce, sugar and hot sauce together. Add the tuna, seaweed, and onions and stir to combine. Top the Poke with the chopped scallions, and inamona. Salt info & tuna poke. And you lived in San Jose too boot (a bit of Hawaiian stuff here). Seriously need you to be in Hawaii to get your take on Asian/Hawaiian recipes! I wait w/bated hungry breath. One of my favorite reasons to visit Hawaii is the poke…aside from the sun, waves, people, and scenery. Great read and photos. Marc, any tips on storing candlenuts? I can only buy them in 250 g packets here. Gorgeous recipe, btw. I’ve never been to Hawaii, yet another reason to go! Hi Dan, because of the high fat content in candlenuts they tend to go rancid faster than other nuts. I usually store mine in a double layer of freezer bags in the freezer. Thanks! It seems that any recipe calling for them cooks them, so that makes a lot of sense. (I’m finding Indonesian curries.) Cheers.